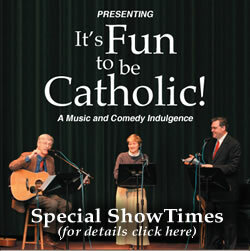 It’s Fun to be Catholic – New Radio Production! – Wednesday, August 29, 7:00 p.m.
– Friday, August 31, 7:00 p.m.
– Saturday, September 1, 2:00 p.m. and 8:00 p.m.
– Sunday, September 2, 2:00 p.m. and 6:00 p.m.
– Monday, September 3 (Labor Day), 2:00 p.m. It can be heard on WDEO (990 AM, Detroit/Ann Arbor MI area) or online at www.AveMariaRadio.net, www.MyCatholicRadio.com, or www.WDEO.org. Before I apologize let's first look at the data from the source in question. It may be the way one wants to read the data, but to call people liars because they read the data the way it is presented by the source is quite disingenuous. There may be a difference of opinion with reading the data, but that doesn't make one a liar — as has been charged. I have copied the chart covering three pages from the World Christian Encyclopedia. I think everyone invovled with apologetics should have a copy of this set. This chart is what all the hubbub is all about. Now you can see the data for yourself — and you can be the judge whose numbers are right and who's are wrong. You can see who is trying to be fair and who is being disingenuous. You can see the Chart for yourself. It is entitled: "Organized Christianity: global membership ranked by 6 major ecclesiastico-cultural megablocs and 300 major traditions AD 1970-2025." This chart is found on pages 16-18 of the World Christian Encyclopedia published by Oxford University Press. Page one, page two, page three. Page three is very significant because it has the total numbers along the bottom. What do you see on the Chart? When you look at the chart you will see the 6 megablocs are 1) Orthodox, 2) Roman Catholic, 3) Aanglican, 4) Protestant, 5) Independent, 6) Marginal Christian. Together these groups made up 33,909 "denominations" (their word, not mine) in 2000 AD. 1) Orthodox broke with Rome around 1000 AD. They are a schism and in 2000 AD made up 764 of this number. 2) Roman Catholics make up 242 of this number but they are almost all in union with Rome just with names like Melkite, Maronite, etc. 3) Anglicans made up 168 "denominations." Though listed in a separate category than "Protestant" they can certainly be seen as "protestant" having broke from Rome in the same century as the followers of Luther and Calvin. However, their numbers are insignificant. 4) Protestants make up 8,973 "denominations." This catagory includes mainline Protestant groups like Baptists, Adventists, Presbyterian, Lutheran, etc. 5) Independent Christian groups made up 22,148 "denominations'' and included groups like Independent Baptist, Plymouth Brethren, Independent Methodist, Independent Lutheran, Apostolic Congregations, Charismatic denominations, Pentecostal, other Adventists, Reformed Anglicans, Independent Reformed Presbyterian, Old Catholic, and many more (see the chart). Now, if you cut these out and say they are not "protestant" then my numbers are false. But even though they are listed as "Independent" they are every bit "protestant denominations." Even if you knock off a few bizarre, questionable ones it still is a huge number. To say that one who counts these as "protestant denominations" are liars is quite disingenuous. 6) Marginal Christian groups make up only 1,596. These include Mormons, Jehovah's Witnesses, Liberal Catholic, Gnostic, Swedenborgian, etc. These are not "protestant" but certainly fall within the pale of appearing as "Christian" to an uneducated observer. By now, 7 years beyond 2,000 AD used by World Christian Encyclopedia, I suspect my number is now too low and maybe I should raise it to 39,000, the number listed on the Gordon-Conwell Theological Seminary site. Now what do we find projected for 2025? Here are the projections which you can also see on the Chart. Catholics will go from 242 in 2000 to 245 in 2025. More rites loyal to Rome will be added. Hurrah! Anglicans will go from 168 to 169. Protestants Mainline denominations will go from 8,973 to 9,490. Independent "protestant" churches will go from 22,148 to a whopping 49,431. Marginals will go from 1,596 to 2,030. Looking at these numbers — with the charts provided so you can see for yourself — if someone wants to call me and the other Catholic apologists liars, then I would be very careful about anything else they tell you. And we may ask who really owes who an apology? Now I put this to an end for I have more important things to do. I will let the opponent have the last word word since he'll take it anyway. Catholic apologists can continue to use 33,000+ as the number of denominations with confidence.